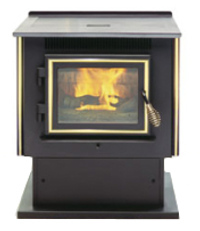 The Pelpro Freestanding pellet stove is a very square and functional entry level unit. It is capable of 42,000 btu. and can heat an area of 1,500 square feet. The maximum burn time is thirty hours. A brick effect fibreboard fireback is standard, as is the stainless steel heat exchanger and the large ash drawer, See comments below). The optional hopper extensions are six and twelve inches high, giving a capacity increase of fifty and a hundred pounds, increasing the burn times to sixty five and a hundred hours. See comments below. Window Size 12.4 in. by 8.5 in. Rear Vent Height Freestanding 17.25 in. Insert 7.75 in. Hopper Extension, 50 or 100 lbs. Brass side trim and shroud trim. 36 in. by 25 in. 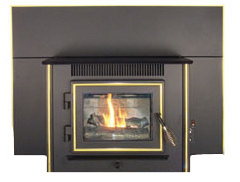 The air damper on the Pelpro Freestanding pellet stove must be adjusted manually to suit the burn rate. Hopper extensions are not available for the insert, which has no ash drawer. Although the manual says a mix of corn and pellets may be used, the warranty says only wood pellets may be used. If you would like to leave a review of the Pelpro Freestanding pellet stove or fireplace insert, please use the form on the contact page.